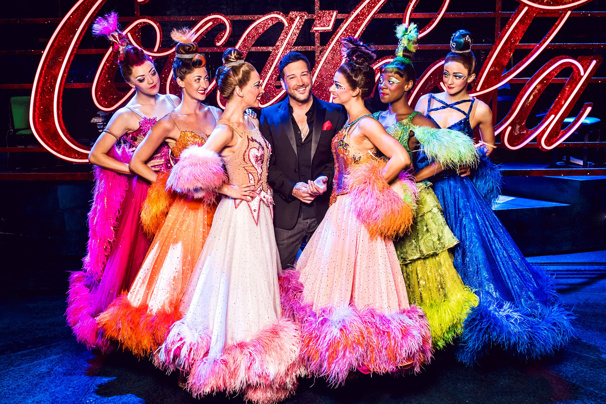 Matt Cardle (center) with the cast of "Strictly Ballroom The Musical"
The acclaimed West End run of Baz Luhrmann's Strictly Ballroom The Musical is coming to an end. The cheered tuner will conclude its engagement at the Piccadilly Theatre on October 27, according to The Stage. Olivier Award winner Drew McOnie (King Kong) directs and choreographs the production, which began previews on March 16 in advance of an April 11 opening night. With a book by Luhrmann and Craig Pearce, Strictly Ballroom The Musical is the story of the maverick championship ballroom dancer Scott who defies all the rules of competition to follow his heart by teaming up with left-footed partner Fran to win the National Championship. The show features classic songs from the film on which it is based, including "Love Is in the Air" and "Time After Time." The musical's cast is led by Jonny Labey as Scott, Zizi Strallen as Fran and Matt Cardle as Wally Strand, along with fellow principals Michelle Bishop, Ivan De Freitas, Gabriela Garcia, Charlotte Gooch, Richard Grieve, Liam Marcellino, Stephen Matthews, Fernando Mira, Eve Polycarpou, Lauren Stroud and Gary Watson. The ensemble features Chris Bennett, Chrissy Brooke, Hannah Fairclough, Selina Hamilton, Christopher D Hunt, Luke Jackson, Justin-Lee Jones, Robin Kent, Jacob Maynard, Leanne Pinder, Tinovimbanashe Sibanda and Dale White.